ASU graduate and entrepreneur Jeff Kunowski founded Illumin8 Media with support from ASU’s Edson Student Entrepreneur Initiative. 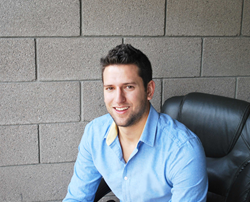 Arizona State University alumnus Jeff Kunowski is Arizona's 2014 Young Entrepreneur of the Year. Jeff is a visionary who can make things happen. Arizona State University alumnus Jeff Kunowski, founder of LED-signage company Illumin8 Media, has been named Arizona’s 2014 Young Entrepreneur of the Year by the U.S. Small Business Administration Arizona District Office. Kunowski, who graduated in 2011 with a bachelor’s degree in integrative studies from ASU’s New College of Interdisciplinary Arts and Sciences, launched Illumin8 in 2010. The company’s portable signage platforms use LED technology to create attractive, highly visible signage products that range from informational and directional signage to revenue-generating advertising platforms. Kunowski first came up with the concept for Illumin8’s signage while driving one evening. He noticed that it was difficult to see advertising signage in the dark, and he set out to develop an innovative product to solve that problem. Using LED technology, he created illuminated signage products that are highly visible, even in the dark. With support from ASU’s Edson Student Entrepreneur Initiative, a startup accelerator in the university's Office of Knowledge Enterprise Development that provides funding, office space and mentorship to ASU student startups, Kunowski set about making his idea a reality. He received a $10,000 grant from the Edson initiative, which allowed him to develop a commercially viable product. After several months of development, he made his first sale, to the Phoenix Suns. Illumin8 has grown considerably since that first sale. The company’s current clients include Anheuser Busch, the MGM Grand Resort and Casino, Live Nation, the Arizona Diamondbacks, the Phoenix Suns, US Airways Center, Maya Day and Nightclub, and more. Most recently Illumin8 struck a deal with CBS Corp. to provide LED promotional signage outside of the CBS Television City Research Center in Las Vegas. In 2013, Kunowski co-founded MK Solutions Group with business partner Douglas Moss to promote Illumin8’s products to sports and entertainment venues throughout North America. In addition to Illumin8, MK Solutions Group represents Panasonic, TS Sports, goCharge and Faucet Impressions. This portfolio of companies allows MK to provide solutions ranging from static LED signage to digital LED video boards to mobile-device charging stations. Kunowski, who was honored at a ceremony in May, also has been awarded a spot in the SBA’s 2014 Emerging Leaders initiative, an intensive training program for small companies that have the potential for quick growth and job creation. During the seven-month program, he will work with experienced mentors, attend specialized workshops and develop connections with peers, city leaders and the financial community. "It is no surprise to me that Jeff is being honored as Arizona’s Young Entrepreneur of the Year,” said Linda Persau, a faculty member in the New College’s Integrative Studies Program. “He is outstanding among his peers in his ability to both network and multitask effectively to reach parallel goals. He has an ability to truly focus on what he wants and then put in the time to create it. Jeff is a visionary who can make things happen." Kunowski has received numerous accolades since founding Illumin8. While at ASU, he was a recipient of the Crown Innovator Scholarship, a scholarship for student entrepreneurs that was created by Insight Enterprises founder and ASU alumnus Eric Crown. In 2012 Kunowski was named one of The Arizona Republic’s “35 Entrepreneurs Under 35,” and he is a member of Sandbox, an invitation-only global network of millennial leaders and innovators. Each year the U.S. Small Business Administration celebrates National Small Business Week by honoring entrepreneurs and small-business champions in each state. See the complete list of Arizona winners. Illumin8 Media’s LED static signs utilize bright and efficient LED light panels to provide vibrant backlit platforms which can be used for advertising, promotional, and directional purposes. Illumin8’s signage platforms come in a variety of sizes, shapes, and applications, ranging from wall mounted indoor signs, to secure outdoor signs, to portable/rechargeable platforms. They are ideal for high traffic areas where there is pedestrian and/or vehicle ingress/egress. MK Solutions Group focuses on providing comprehensive technology solutions for sports and entertainment venues. MK’s alliances with innovative technology providers allow for custom tailored solutions for any size project. Current alliance companies include: Panasonic Eco Solutions, TS Sports, Illumin8, goCharge, and Faucet Impressions. The Edson Student Entrepreneur Initiative gives Arizona State University’s student entrepreneurs the opportunity to develop their innovative ideas and launch viable startup companies. Based in ASU's Office of Knowledge Enterprise Development, the initiative offers approximately 20 student-led teams each year up to $20,000 each in seed funding as well as office space, training and mentorship to help launch and grow their for-profit, nonprofit or more-than-profit ventures.